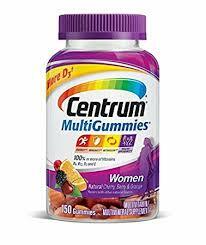 SCORE 2 FREE CENTRUM VITAMINS !! NOW THROUGH SATURDAY 3/10/18 SHOP RITE HAS CENTRUM GUMMIES VITAMINS ON SALE 2 FOR $9.98. SEE DEAL BELOW. FYI FOR THOSE OF YOU WHO STORES ALLOW OVERAGE.. THERE WILL BE $2 OVERAGE THAT WILL BE APPLIED TOWARDS ADDITIONAL ITEMS! HOWEVER BE MINDFUL THAT ALL STORES DO NOT OFFER OVERAGE! !